Please join State Democratic Party Chair Tim Vandeveer on Maui for a meet and greet of newly hired Democratic Party of Hawaii Executive Director Laura Nevitt on Friday, March 31, 2017 from 6-8 p.m. at Giannotto’s Pizza located at 2050 Main Street in Wailuku. Learn about her background and her work to move our party forward! Pizza will be served. The event is free and all members are encouraged and welcome to join! 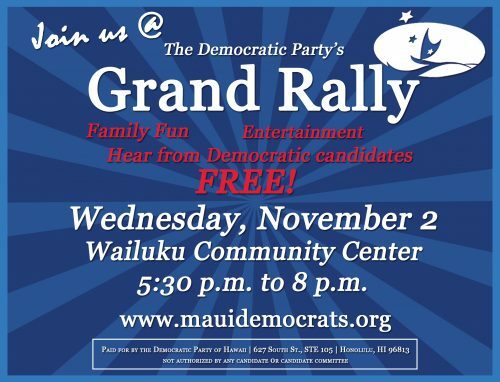 If you are planning on attending please email mauicountydemocrats@gmail.com – see you there! This entry was posted in Maui Democrats on March 17, 2017 by Maui Democrats. WHERE: EDDIE TAM MEETING ROOM 931 Makawao Ave., Makawao in the back, below the gym. Look forward to seeing you on the 20th at 6:30 at Eddie Tam (lower meeting room). There will be food, of course, desserts, because dinner will be over, what would a meeting be in Maui without it? This entry was posted in Maui Democrats on March 14, 2017 by Maui Democrats. Nominations are now being taken for Executive positions for the Democratic Party of Hawaii, Maui County Committee. Applications are due on Wednesday, March 22, 2017. This entry was posted in Maui Democrats on March 1, 2017 by Maui Democrats. Please join the Maui County Democratic Party for a training with Virginia Beck from the Hawaii State Legislature’s Public Access Room to learn more about effectively navigating the legislative process. • Newcomers and seasoned advocates welcome! Additionally we will review the Democratic Party of Hawaii’s Legislative Priorities. The event is this Tuesday, February 28, from 6-8 p.m. at the University of Hawaii Maui College in Laulima 105. For more details or questions, please reach out to Arianna Feinberg via phone at 808-280-0988 or email at ariannafeinberg@gmail.com. This entry was posted in Maui Democrats on February 23, 2017 by Maui Democrats. WAILUKU, Hawaii – The Maui County Democratic Party will host its traditional Grand Rally at the Velma McWayne Santos Community Center (Wailuku Community Center) on Wednesday, November 2 starting at 5:30 p.m.
Special guest speakers include Governor David Ige, U.S. Senator Brian Schatz, U.S. Representative Tulsi Gabbard, State Party Chair Tim Vandeveer, and surrogates for our next President, Hillary Clinton. The Rally is a rare opportunity to meet all local and state Democratic candidates who will appear on the ballot in one place. There will be booths by each candidate, and an appearance by the award winning Maui High School Band! This free event is open to any Democrats or those supporting Democratic candidates. For any questions, contact Party Chair Troy Hashimoto at mauicountydemocrats@gmail.com. This entry was posted in Maui Democrats on October 26, 2016 by Maui Democrats. PLEASE RESERVE NOV. 8TH ELECTION DAY TO VOLUNTEER TO GOTV !!!!! We will have Phone Banks scheduled throughout the day at various locations around the island followed by Election Day Parties. Hillary is counting on your support to GOTV. So, please let us know that I’M WITH HILLARY and I will volunteer to Phone Bank on Nov. 8th. Details to follow. This entry was posted in Maui Democrats on October 25, 2016 by Maui Democrats.